WOULD YOU TRY A PIZZA WITH A PRETZEL CRUST? 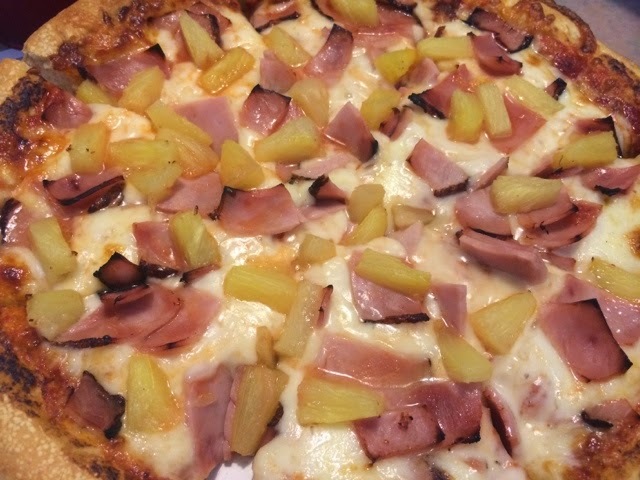 Hawaiian pizza is my favorite kind of pizza, but it can be tough to find the perfect Hawaiian. Sometimes there's not enough pineapple or not enough ham. But at Irene's Family Restaurant in Norwich, CT, you'll find a Hawaiian with the perfect ratio of ham and pineapple. They pile it on with plenty of cheese. 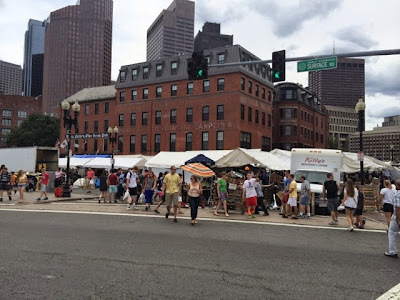 If you've ever been near Faneuil Hall on a Saturday, chances are you've seen this gigantic farmer's market. Bostonians have shopped here for two centuries. You'll find every kind of fruit and vegetable here and the prices couldn't be any lower. How about two pints of blueberries for $1? Maybe pineapples that are 2 for $1? 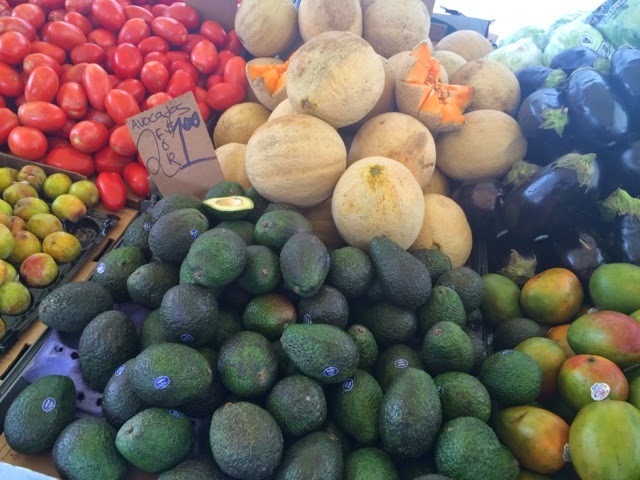 Of course, like anywhere else, you'll want to thoroughly inspect your produce before buying it. I got 4 ears for corn for $1 over the weekend and they were as fresh as can be. The farmer's market happens every Friday and Saturday from dawn to around 6 pm. 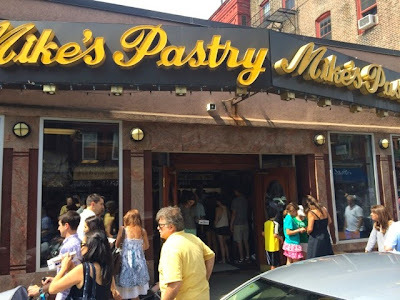 It's impossible for me to take a trip to the North End in Boston without stopping at Mike's Pastry. 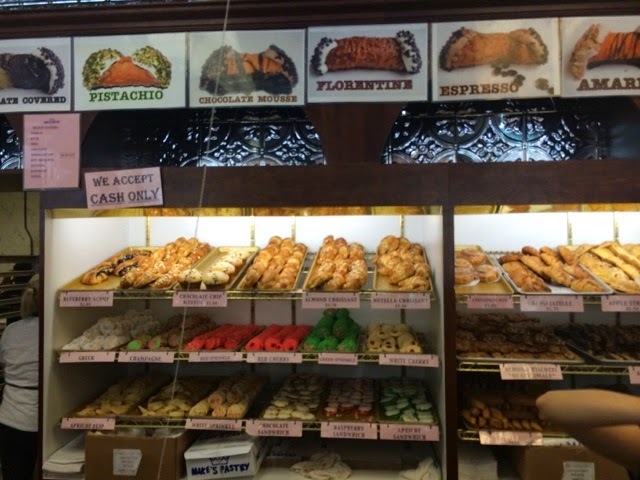 This Italian bakery is LEGENDARY on Hanover Street and once you order anything on their menu, you'll know why. From cupcakes to cookies, they have every kind of baked good and sweet you can image. 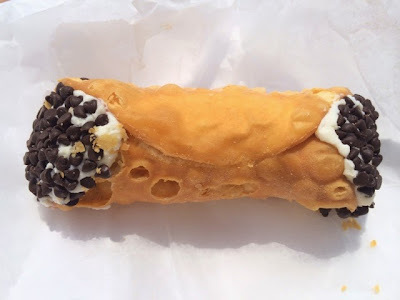 They even have several flavors of gelato.There are so many different kinds of cannolis. 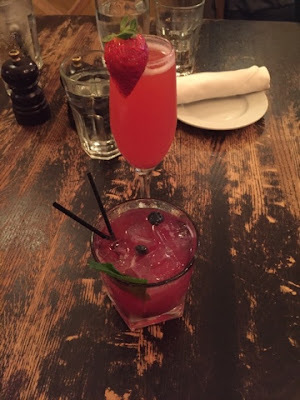 It's tough to pick one, so bring a bunch home. My favorite is their choclate chip cannoli. The shell is the perfect texture and the filling is off of the charts! Perfection. I also can't seem to leave Mike's Pastry without a bag of their champage cookies - you know, the Italian cookies with sprinkles around the edges. And did I mention their strawberry cheesecake? Out of this world. Mike's is always packed with locals and tourists, but don't let the line intimidate you. Us locals know how to quickly make your way to the front and even if you don't, you'll be in and out in no time. 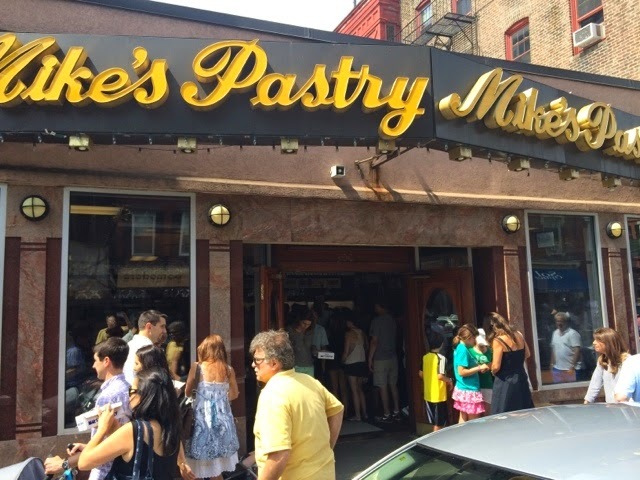 No trip to the North End is complete without a visit to Mike's. Chicago is known for its deep dish pizza and Giordano's is one of my favorite places to get one in the Windy City. Girodano's is known for their stuffed pizza. It's layers of cheese, sauce and toppings. Kind of a like a lasagna. Plus, it's topped with sauce instead of cheese. An individual 6" pizza should fill you up. I can highly recommend their sausage pizza, but you can get it with any toppings you'd like. 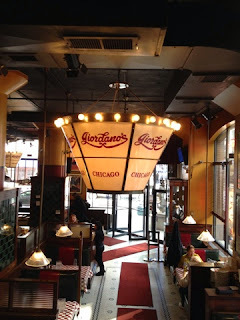 Giordano's also has $10 lunch specials where you can have a 6" pizza with a drink and a side like garlic fries, soup or salad. Also on their menu are thin crust pizzas, sandwiches and pasta. 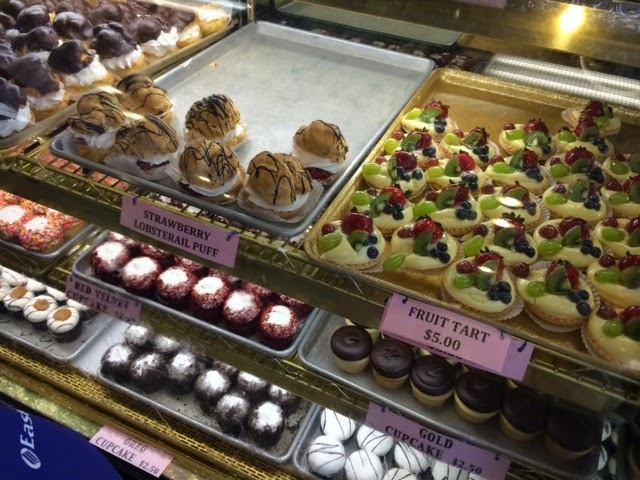 If you have room for dessert, they have Italian favorites like tiramisu, mini cannoli and s'mores pizza. 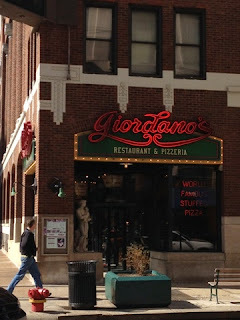 Giordano's has many locations all over Chicago, You can even get one of their pizza delivered to your home online! If you go, let me stress again, get a pizza! 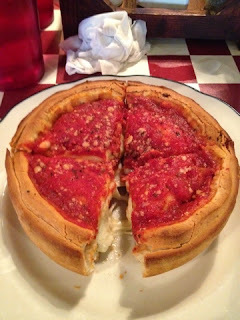 It's been raved about in the New York Times, Chicago Tribune and was voted best pizza in 2014 in Chicago Magazine's Readers' Choice. 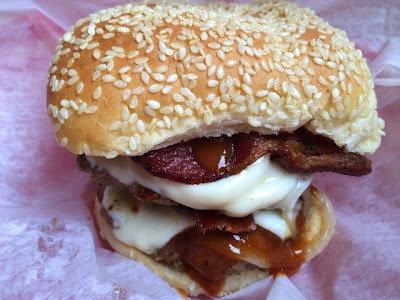 A big, juicy burger is one of my favorite comfort foods and Goldburgers in Newington, Connecticut is serious about making making tasty burgers of all sizes. There are so many unique burgers on their menu. There's the pizza burger, 2 beef patties with sauce and mozzarella cheese. How about the "Southern" burger? It comes with BBQ sauce, coleslaw, cheddar cheese and potato chips. There's also the "Mac Patty" with one beef patty, one mac & cheese patty, jalapenos and mac and cheese. How good does that sound? If you want to get cdrazy, order the "3x4" with 4 beef patties cheese and bacon. I played it safe and ordered the "Honey BBQ Bacon Burger." It's two beef patties on a sesame seed bun with American cheese, Honey BBQ sauce, bacon and grilled onions. So very good! You can make your own hamburger just the way you want it. They also have sliders for $1.99/each or $7.89 for a 4-pack. They also have sausage, chicken and veggie burger, along with breakfast sandwiches and burritos. You can't be a burger joint without some hot dogs on the menu. Goldburgers has a bunch including the "Coney Dog" with chili, onion, nacho cheese & mustard. Or try the "PBR" with pickles, bacon, ranch dressing, grilled onions and pepper jack cheese. You can't have a burger or hot dog without a side. I'd highly recommend getting a "1/2 & 1/2." That's two half-sized portions of their sides. 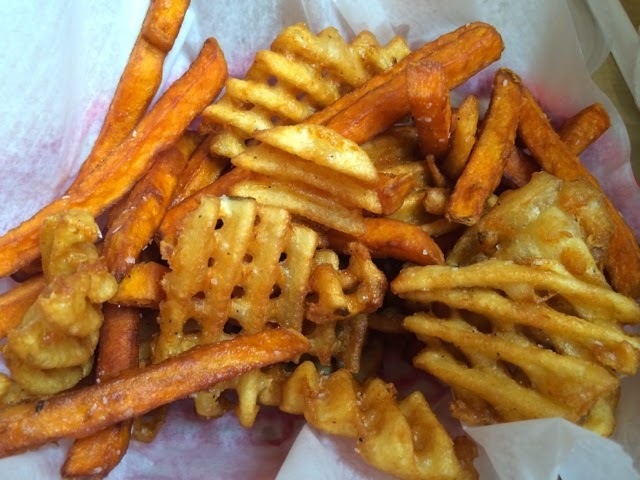 We enjoyed their waffle fries and sweet potato fries. Goldburgers also has onion rings, regular fries and cheese fries. 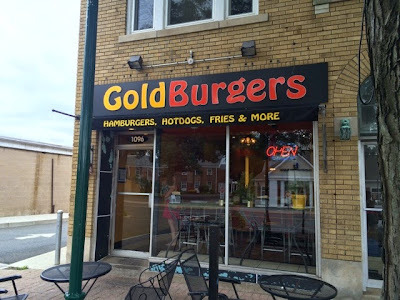 Goldburgers is a nice family restaurant with big portions. Check them out the next time you have a craving for a burger and fries. Ice cream. Seafood. Mini golf. Bumper cars. 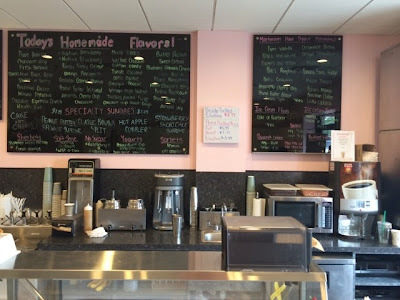 All of these things make summer so good and you can find all of it and more at Kimball Farm in Westford, Massachusetts. 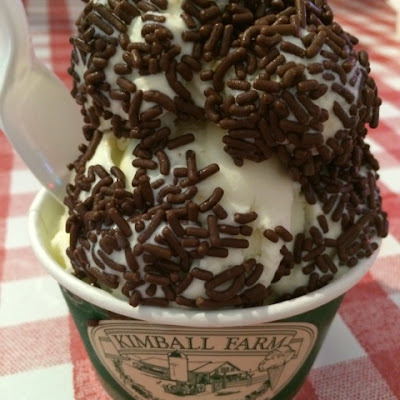 The main attraction at Kimball Farm is its ice cream. I've never seen a place with so many ice cream windows. They need them because the crowds are huge in the summer. This is one of those places that is super generous with its ice cream. A small is the size of a large at other ice cream shops. I couldn't finish my small cookie dough. Kimball Farm has all of your favorite flavors and more. It's August and they already have my fall favorite, pumpkin ice cream! They'll also pack a pint for you to bring home. 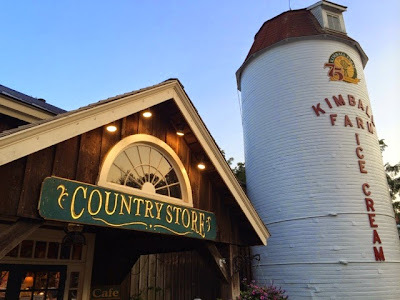 Kimball Farm is the perfect place for a day trip for families. They have a large country store/gift shop, petting zoo, an arcade, bumper cars and a wicked fun 36-hole mini golf. We did a round of mini golf and this is one of the most beautiful and challenging courses in New England. It has huge waterfalls and is beautifully landscaped. 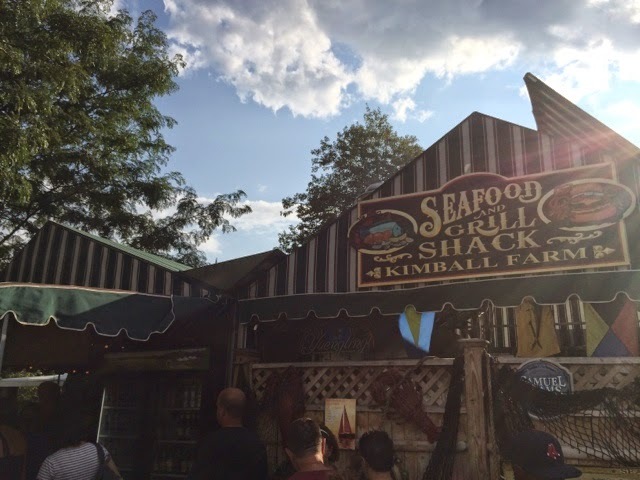 Visitors can also grab a meal at Kimball Farm. 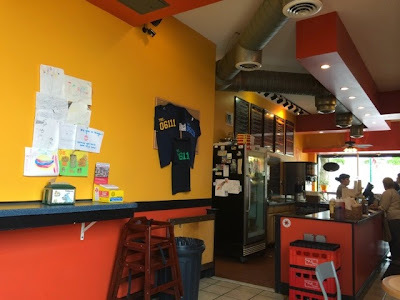 Inside, there's a little sandwich shop that serves coffee, pastries and salads. Outside, you'll find their grill which serves all kinds of seafood including lobsters, clam strips and scallops. They also have a pulled pork sandwich, veggie burger, chicken fingers, burgers and hot dogs. 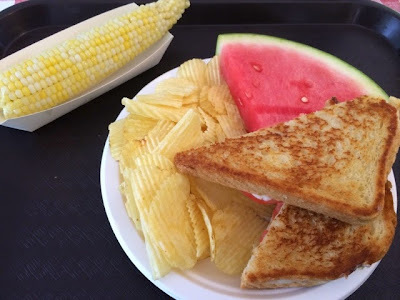 I enjoyed some corn on the cob along with a grilled cheese and tomato which comes with chips and a huge hunk of watermelon. 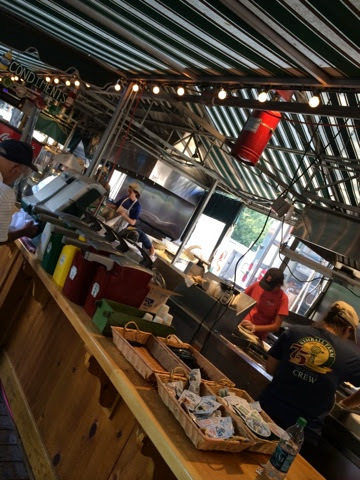 The line for the grill can be long during peak times, but it goes fast. 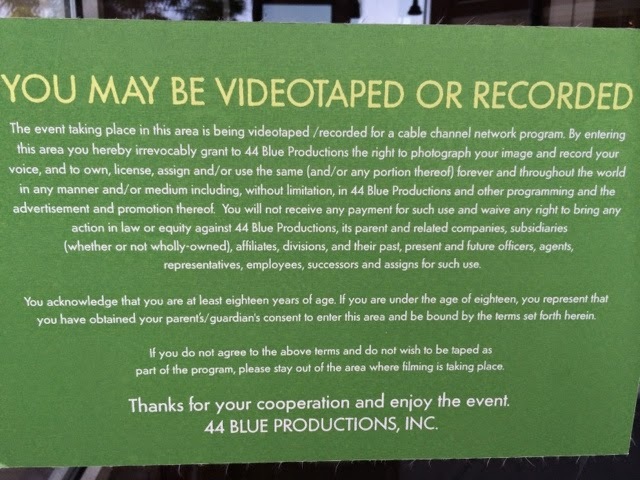 These signs are posted on the doors telling customers that they may be taped for the Wahlburgers reality show. Grab a burger and show up on national television. 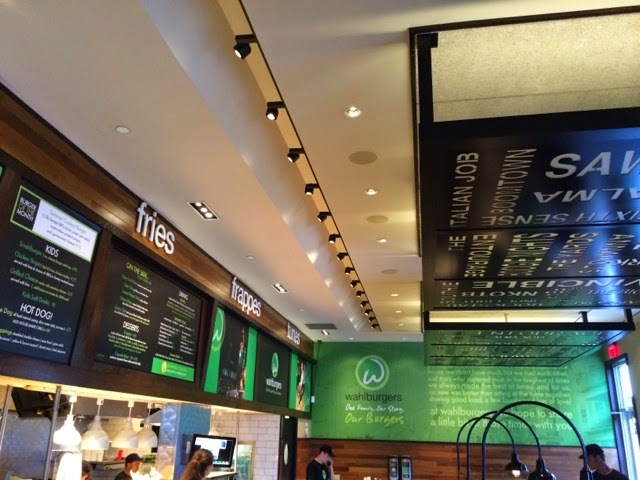 It could happen at Wahlburgers in Hingham, Massachusetts. Of course, this restaurant is the subject of the Wahlberg's reality show on A&E. 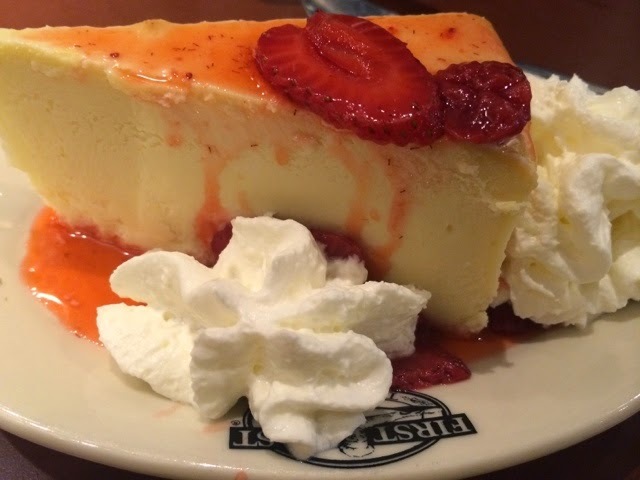 The show follows chef Paul Wahlberg and his famous brothers, actors Donnie and Mark. 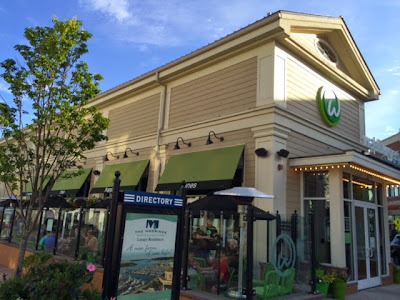 I've been wanting to check out Wahlburger's for a long time and finally got my chance! 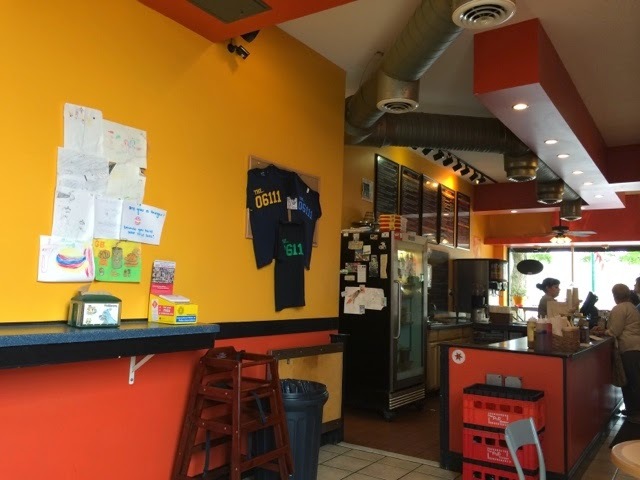 Diners can sit down for table service or order at the counter. This is no ordinary burger joint because Wahlburgers has a full bar. 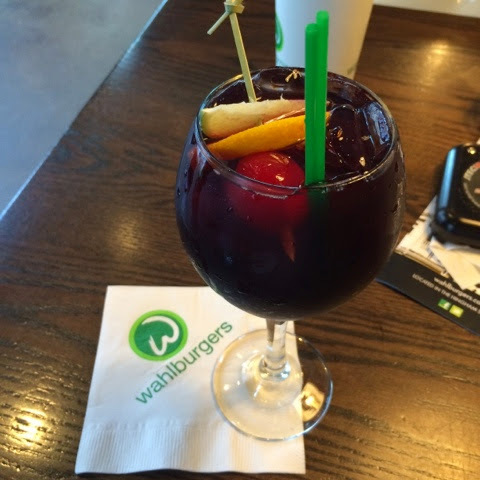 I got a big glass of red sangria, which I found quite refreshing on a hot summer night. You can order a burger any way you want it or go for something daring like Mark's Choice, the Thanksgiving Burger, with turkey, stuffing, orange cranberry sauces, squash and mayonnaise. I played it safe and tried Donnie's Choice, the BBQ Bacon Burger with nice side of tater tots. Any restaurant that serves tater tots is okay by me! And did a mention they also have sweet potato tots?! There are several salads on the menu including Alma's macaroni salad with elbow macaroni, sweet peppers and creamy mayo dressing. Mmmm. Also on the menu: a chicken burger, salmon burger and a portobello mushroom burger for vegetarians. 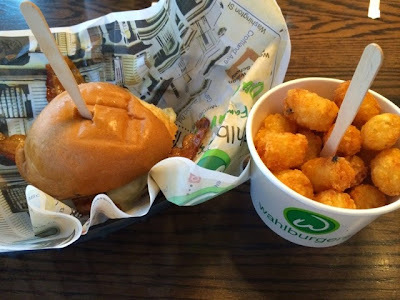 Wahlburgers has a kids menu with the chicken fingers, a hot dog and grilled cheese. There are also lots on non-alcoholic beverages up for grabs including frappes, sodas and Mexican coke. By the way, a new season of Wahlburgers starts Wednesday, August 13. 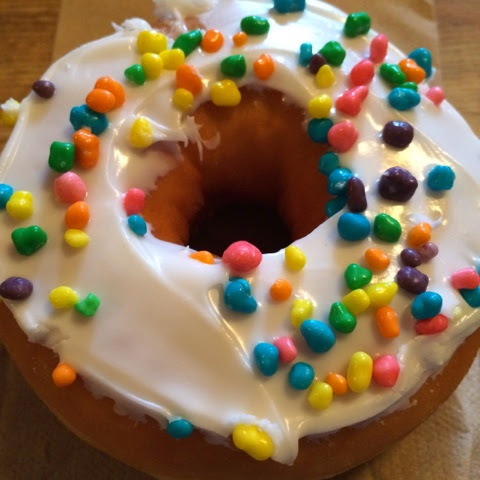 HAVE YOU TRIED A NERDS DONUT? 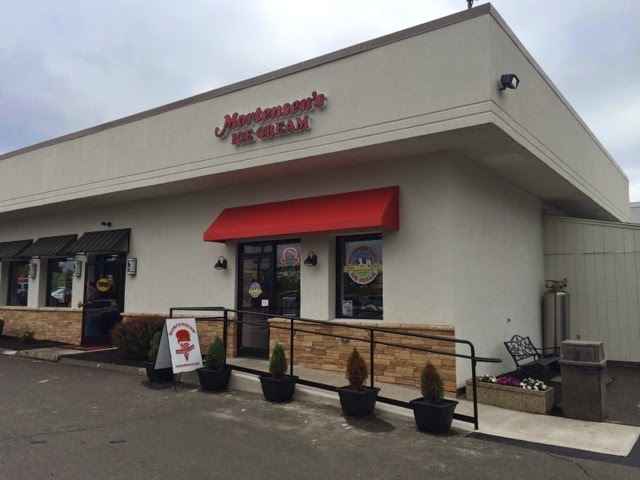 Mortensen's Ice Cream now shares a building with Moe's. I visited for the first time over the weekend and was happy to see that their new ice cream parlor still has many of the same flavor of the old restaurant. 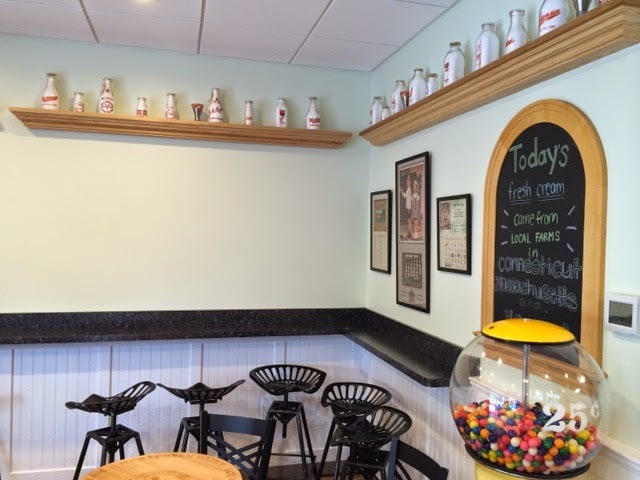 Milk bottles line the ceiling, along with some new tables. I'm also encouraged by the pie display that's still in their store. It's empty now, but I'm hoping it will be filled with Mort's very popular pies by the holidays. 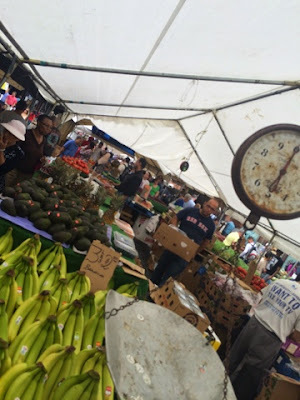 It wouldn't be summer without the Taste of Hartford. For two weeks, meals are discounted at participating restaurants throughout the city. This year, like every year, I ran to the First & Last Tavern. I went for lunch, but they were kind enough to offer me the Taste of Hartford menu that's normally reserved for dinner only. 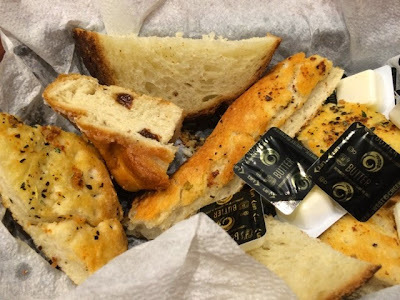 Every meal at First & Last starts with an overflowing basket of their homemade breads. The focaccia is THE BEST! If you visit on the weekend, you'll be lucky enough to get some of their soft and sweet raisin bread. Like I always say, don't fill up on bread. There are 3 courses on the way! I started off feast with their tossed salad. It's not your average boring side salad with just greens and tomatoes. This one comes with chickpeas, cheese and salami. Wicked good. 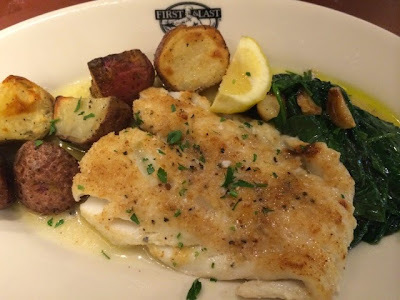 For dinner, I choose the scrod with potatoes and spinach. The scrod was cooked to perfection, sitting in melted butter. The spinach was tossed with cloves of garlic for some added Italian flavor. 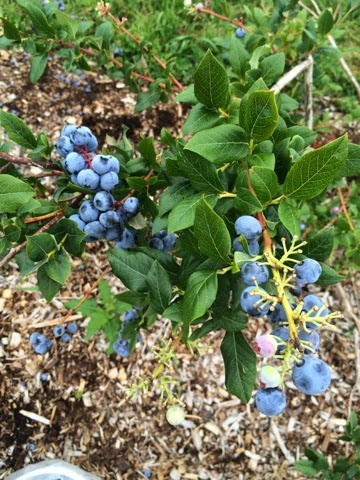 IT'S BLUEBERRY SEASON IN NEW ENGLAND! 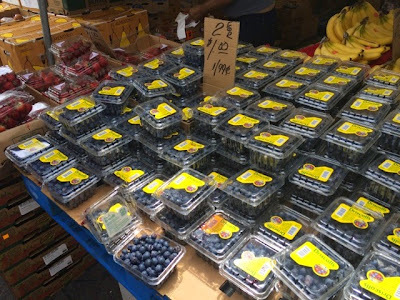 It's blueberry season - that wonderful time of year when blueberries are only $1.99/pint at grocery stores and you can pick your own at so many places across New England. This weekend, I was at Rose's Berry Farm in South Glastonbury, Connecticut filling up a huge bag of berries. I've been getting blueberries at Rose's every summer for the past decade. Blueberries are in their prime right now and there really is nothing better than some FRESH blueberries.